On this date in 1894, bomb-throwing anarchist — literally — Auguste Vaillant was beheaded in France. 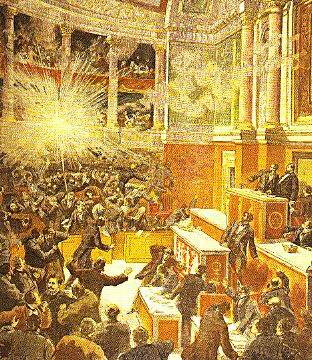 The preceding December, the young Vaillant (French Wikipedia link) went from impoverished obscurity to national bogeyman by hurling a bomb into the Chamber of Deputies — reprisal for the 1892 execution of the anarchist Ravachol. Vaillant’s dying sentiment was taken up by Emile Henry, who bombed a Paris cafe the next week, and Sante Geronimo Caserio, an Italian immigrant who assassinated French President Marie Francois Sadi Carnot four months later.